Music, dance and people from countries around the world gathered in Mountain View Lions Park Friday for Anchorage’s annual World Refugee Day celebration. The event is organized by Catholic Social Services’ Refugee Assistance & Immigration Services, which has brought 80 refugees to Alaska over the past eight months alone. Shelly Paw, a Burmese refugee who arrived in Anchorage in 2012, said the program helped her family open a new chapter in their life. After spending four years in a Malaysian refugee camps, Paw said she and her husband spent four more years seeking asylum in Malaysia and Thailand, forced to work illegally and struggling to survive. In order to come to the United States, Paw said they went through a lengthy application and interview process. She said it was worth the wait. “When we arrive here, we are free,” Paw said. When she boarded a flight to Anchorage in 2012, she was eight months pregnant with her daughter, Jaseng. Paw said Catholic Social Services helped her family find housing and food, taught her how to use the municipal bus system and sent her to Nine Star to learn English. 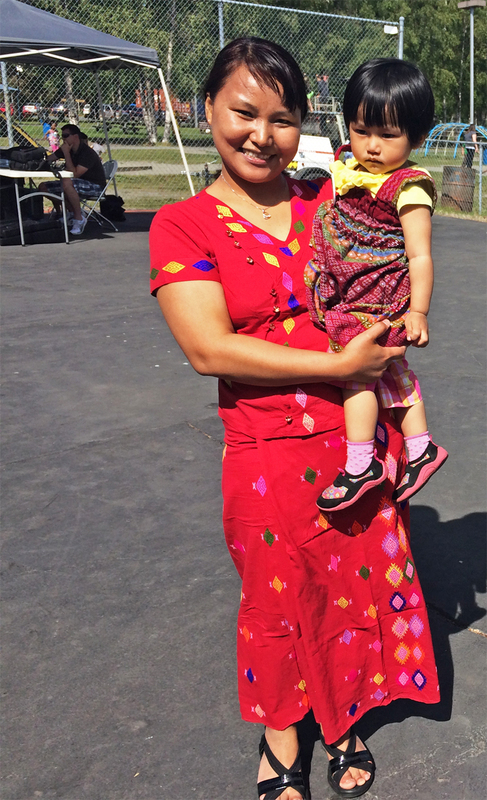 Two years later, Paw held her young daughter and helped translate the Refugee Day celebration for other Burmese families who now call Anchorage home. Friday’s event included an awards ceremony honoring volunteers, businesses and organizations who’ve helped welcome refugees to Alaska. Abdikarim Mohamud, Joan Borash, Karel Henkel, Mary Bloes, Kay Gajewski, Ingrid Everson, Bruce Whelan, Lance Powell and Javid Kamil were all recognized for their volunteerism. Dr. Karen Ferguson, RAIS director, was honored for her extensive work at the helm of the program. After the accolades came the music and dancing, including Hmong, Sudanese, Bhutanese and Polynesian performances. There was a free BBQ, and a line of people wrapped around the perimeter of the parking lot, filling plates of food in between performances. Families laughed and snapped photos, and music filled the air. It was a real celebration.